Upland offering rates initially weakened during April, before staging a strong rally that persisted almost until the end of the month. 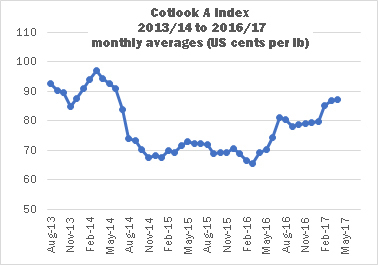 On April 27, the Cotlook A Index reached a high point for the month of 88.80 cents per lb, which was the highest daily value recorded since the end of June, 2014. At just over 87.00 cents per lb, the average of the Index for April was the highest recorded since the same month. The market was led principally by movements in the New York futures market. Speculators’ historically high net long margin had declined somewhat since early March, but during the second half of April rose once again, to exceed 40 percent of the open interest on April 25. The upturn of trade offering rates during the second half of the month was accentuated to some extent by strengthening basis levels, relative to New York, for certain growths. Underlying support was also derived from the strength of mill demand in the physical market (buying has been more vigorous than had been anticipated since the beginning of the year) and the very strong pace at which marketing of US cotton, in particular, was sustained. In recognition of the impressive momentum of recent US sales activity, in its April supply and demand statistics, USDA made a sharp upward adjustment to its forecast of US exports during the 2016/17 marketing year, from 13.2 to 14.0 statistical bales of 480 lbs. US exports of that magnitude would be the fourth highest on record. As far as the current supply and demand situation is concerned, moreover, the effect of that adjustment was significant, since instead of indicating a rise in US stocks by the end of the current season, as had been the case for several months, Washington now foresees that the carryover will shrink, albeit modestly. If one allows also for the portion of the current US crop that has been committed against export requirements early in the next marketing year, the US supply position has been significantly depleted, suggesting that nearby futures should remain firm in order to ration demand. As the uncommitted supply from the 2016/17 US crop has dwindled, the two principal sources of cotton available to the international market, prior to the movement of the 2017/18 Northern Hemisphere crops in the final months of the year, are Australia, whose harvest is in full swing, and Brazil, where picking will begin in a couple of months. Commitments from both origins to the international trade are already heavy, which may serve to diminish the probability of significant selling pressure at origin over the coming months. Sales from China’s state reserve, which began in early March, maintained a fairly good rhythm throughout April. By the end of the month, the cumulative total of cotton disposed of at the daily auctions was close to 870,000 tonnes. Although some reservations are expressed with regard to the quality composition of the quantities that remain in the reserves, the progress made so far suggests that, by the time the current season reaches its scheduled conclusion at the end of August, a quantity close to the 2.6 million tonnes sold at the corresponding series last year, will have been absorbed by the market. Over two years, therefore, a sizeable reduction in the huge stocks accumulated by China between 2011/12 and 2013/14 (over eleven million tonnes at the start of the auction process) would have been achieved. If that comes to pass, the point will have drawn nearer at which China is expected to adopt a less restrictive import policy, in order to meet the country’s structural import requirement. What level of residual stocks the Chinese authorities might consider ‘manageable’ is not known, with the result that a confident prediction of the end of current destocking process is a matter of considerable conjecture in international trade circles. A long-term projection released by the Ministry of Agriculture in late April indicated imports by 2020 at 2.4 million tonnes (versus the recent level of approximately one million). The report failed, however, to predict at what point import volumes might begin to rise strongly, which would of course be a bullish development, as far as world cotton prices are concerned. In the meantime, sowing is already under way in many parts of the Northern Hemisphere, amid expectations of a substantial rise in new crop production. In particular, farmers in the United States and on the Indian subcontinent clearly manifest an intention to expand the area devoted to the 2017/18 cotton crop. Weather-related setbacks have so far been minor, but at this early stage production forecasts must as always be treated with caution. Over the next few weeks, the likely rate of abandonment in the key US producing region of West Texas will become clearer. In India, the distribution of monsoon rains from early June promises as always be the single most important factor affecting yields. Some reassurance will have been gained from the Indian Meteorological Department’s first long-range forecast, which suggested a ‘normal’ monsoon. Cotton Outlook’s forecasts for the new season indicate a rise in world output of more than 1.7 million tonnes, to 24.4 million (close to the average for the past ten seasons). 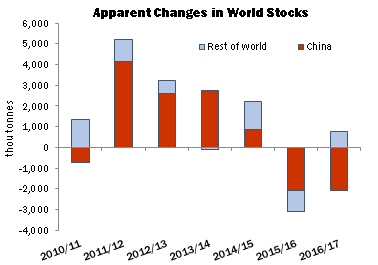 Although world production and consumption are projected to be broadly in balance, a predicted rise in world stocks outside China in excess of 1.9 million tonnes sends a rather bearish signal. The prevailing firmness of current crop prices thus stands in contrast to the prospect of a substantial increase in ‘rest-of-world’ supplies during the 2017/18 season, should the prevailing optimism with regard to the production outlook prove warranted. December futures have of late been trading at a discount of 300/400 cent points or more below the final current crop delivery month, July. 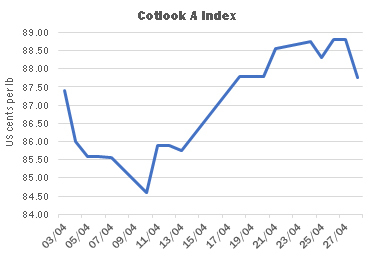 The Cotlook Forward A Index, which reflects offers for shipment no earlier than October/November, was introduced on March 24 at a level 270 cent points below the current season’s Index, a discount that had widened by the end of April to 460 points.